In the increasingly competitive OTT market, competition for viewers is high. Providers must find ways to not just deliver compelling content, but to deliver compelling viewing experiences. 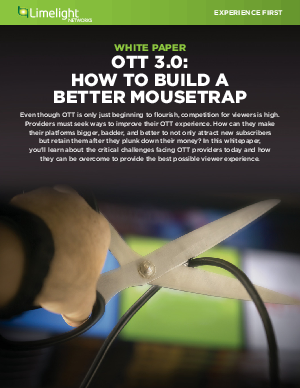 In this whitepaper, you’ll learn about the critical challenges facing OTT providers today and how they can be overcome to provide the broadcast quality experiences viewers expect, regardless of the device in use or the viewers location in the world. Are you ready to keep your subscribers happy and away from your competition?